Consider adopting a cat to keep at your barn, warehouse or business. 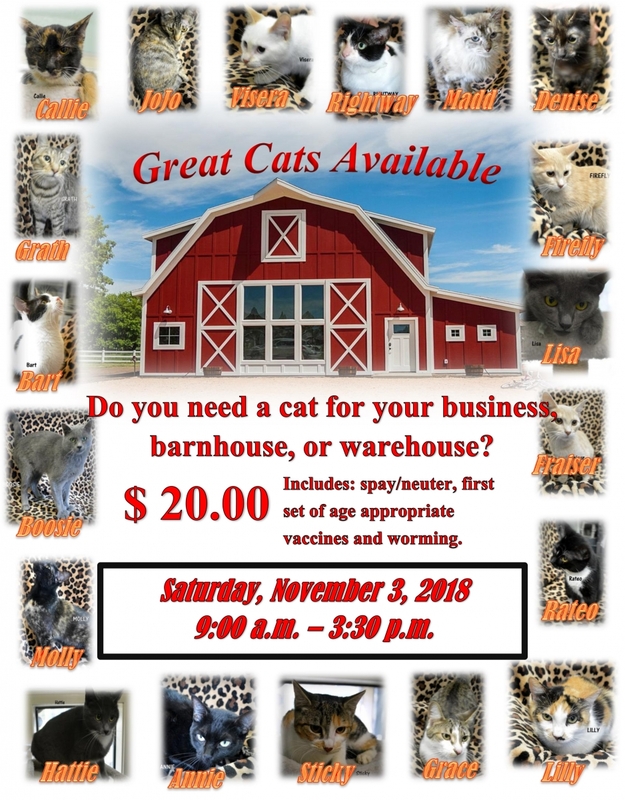 The City of Mobile Animal Shelter will hold a Barn Cat Adoption event this Saturday, Nov. 3 from 9 a.m. to 3 p.m. There are about 20 cats available for this special adoption. Although barn cats are not your typical indoor pets, they deserve a home and someone to take care of them. Barn cats are great for discouraging rodents and providing companionship for horses and other farm animals. The adoption fee is $20, and includes spay/neuter and the first set of age-appropriate vaccines and worming. At the event, the public will also be able to see other pets available for adoption. The Barn Cat Adoption event will take place at the City of Mobile Animal Shelter located at 855 Owens Street, and runs through Nov. 10.